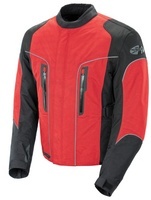 Meta Sport II System Features a completely removable outer layer that covers a complete mesh jacket underneath! Have a look at Joe Rocket’s sizing chart. We feel this size chart gives an accurate estimate of size for this product. “Talls” are available in black. The tall sizes add 1” to 1 1/2” to the sleeve length and body length. Use the drop down menu above to see the available sizes. Joe Rocket’s Alter Ego 3.0 textile jacket is designed to keep you comfortable and protected in all sorts of weather. Previous designs of this jacket were a bit more elaborate than this design. Previous designs had various solid textile panels that zipped on the “base” jacket to allow for more or less air flow. The result was effective when the jacket was in the solid textile mode (all panels in place), less effective than this new one when the panels were removed. The reason is that this design is really one complete mesh jacket (with armor and a removable liner) with a solid textile shell that installs over the top of the entire jacket. The result is that you get a fully waterproof shell when the solid textile part is in use (which is better than before) AND you have a FULL mesh jacket with the solid textile shell removed. Also, I see that this design has fewer complex zippers which will result in fewer failures down the road. We have a good spread of photos that show the various parts of the jacket which will give you a good idea of how it works. The concept of a fully convertible jacket is a good one. I can see where it would be particularly useful for those who tour in a wide range of weather conditions. It would have the effect of reducing the amount of gear you have to carry. For a person who commonly rides on short trips around home, I’d question whether it would make more sense to just buy two jackets to cover all eventualities. Anyway, life is about making choices and the Alter Ego certainly offers a good one not found elsewhere. Note about armor: Joe Rocket’s original literature talked about “pockets for optional armor in the textile shell”, but we didn’t see this feature on the production jacket. I’m not sure you’d want to do that anyway… the outer shell without the underlying mesh/armor jacket would fit sort of large as compared to the underlying mesh jacket. Maybe they abandoned that idea? Anyway, we don’t see that feature.